Ever wanted to straighten your teeth without metal braces? See how Invisalign can realign your smile discreetly and with maximum comfort and convenience. Invisalign is the proven contemporary solution for correcting crooked and misaligned teeth without the irritation or metallic appearance of old-fashioned braces. Using a series of custom-crafted transparent aligners designed specifically for your mouth by means of a 3-D computer imaging system, the Invisalign system gradually shifts your teeth into their proper positions until the desired results are achieved. Each removable aligner is virtually invisible, so no one will know that you’re wearing the aligners unless you choose to tell them, and because there are no brackets or wires, Invisalign aligners are far more comfortable than traditional orthodontic devices. The instructions for Invisalign treatment are easy to follow: simply wear the aligners as you go about your daily actions and while you sleep; remove the aligners to brush, floss, and eat; and switch to a new set of aligners about every two weeks. 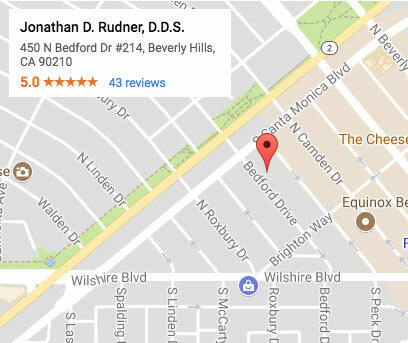 During the course of your Invisalign treatment, you will visit our Beverly Hills and Santa Monica area office about once every six weeks so that Dr. Rudner can monitor your development and ensure that your treatment is progressing properly. Total treatment time will vary depending on the severity of your misalignment, but usually within 12 to 18 months your teeth will move into their desired positions, giving you a straight, gap-free smile. Minor tooth alignment issues can often be corrected in as few as six months, and Invisalign treatment can be combined with teeth whitening for a complete smile makeover with highly aesthetic results.